Jonny Bairstow made his case for a place in England's Test side to face India with a hundred on day one of the tour match against Mumbai A.
Bairstow made 118 to rescue the tourists from 66-4, sharing a stand of 156 with Eoin Morgan (76). Samit Patel continued his good form with 56 not out as England closed on 338-6, but Ian Bell again fell cheaply. "It was a second XI bowling attack but Bairstow's impressive 118 still gives the selectors plenty to think about. 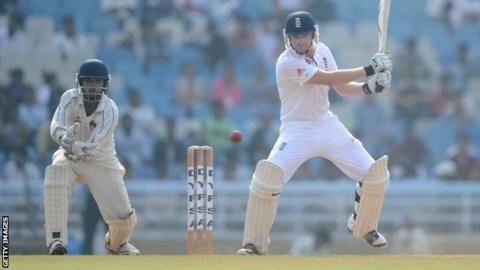 A second innings for both Compton and Root will be very useful as England figure out who will open in the Tests. Bell may start to feel under pressure, while Patel underlined the competition for places in the middle order." Nick Compton made only one, while Joe Root, the other to option to open with Alastair Cook in the Tests, hit 28. Captain Cook, along with Matt Prior, Kevin Pietersen and Graeme Swann, has been rested, with vice-captain Stuart Broad leading England - while paceman Stuart Meaker has been called up to the squad as cover for the injured Steven Finn. As he watched, the skipper would have seen that the form of Bairstow, Morgan and Patel provides options in the middle order for the four-Test series, particularly with Ian Bell set to return home for the birth of his first child, which is due to arrive during the second Test. However, neither Compton or Root made the sort of contribution that would provide a clear indication as to who will replace the retired Andrew Strauss as Cook's opening partner. After a third-ball duck against India A, Compton was bowled by a good delivery from right-arm seamer Kshemal Waingankar, while Root's painstaking 28 from 75 balls was ended by a catch at short leg on the stroke of lunch. Jonathan Trott shared a half-century stand with Root, but wafted at a wide one to edge behind, while Bell was also caught behind for his second single-figure score of the tour when Waingankar found more movement. The rebuilding was left to Bairstow and Morgan, both men whose hopes of playing in the first Test seem to rest on England fielding six out-and-out batsmen or the less likely option of Trott being moved up to open with Cook. They performed well against a workmanlike attack on a decent pitch, surviving only one moment of luck when Bairstow was put down by Waingankar on 56. Bairstow, who made 95 and 54 in England's last Test after being called up to replace Pietersen, showed sound shot selection and brought up a 158-ball hundred with a fierce cut shot. "I can only score as many runs as I can, work as hard as I can in the nets and do everything in my power to put my case forward for that final selection," said Bairstow. "There's a massive amount of competition in that middle order, but there's only 11 people who can play. "So you hope scoring a weight of runs in the warm-ups means you're pushing for a place in that side." At the other end, Morgan clubbed the medium pace of Suryakumar Yadav over long on for six early in his 81-ball half-century. Shardal Thakur eventually had Morgan lbw with a yorker, allowing Patel to arrive to share a near run-a-ball century stand with Bairstow, which ended when the Yorkshireman was caught at first slip just before the close.